Have you ever wished of combining the functionality of Google Chrome, the power of Firefox and strength of Internet Explorer to produce an awesome browser? Well, look no further, This is that program. 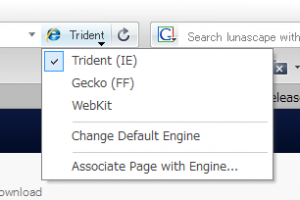 It features an intuitive tabbed interface and three rendering engines; Firefox Gecko, Internet Explorer’s Trident and Webkit which powers both Google Chrome and Apple’s Safari. You can also customize the toolbar items on the interface to create a familiar interface. The application comes with support for gestures, mouse and keyboard combinations. This allows you to create shortcuts for frequent actions for easy accessibility. Though the shortcut might not work on tabs, window or hyperlinks. This software is perfect for both developers who wish to test their program across multiple browsers and people who desire to have the best of different browsers in one place. Lunascape is licensed as freeware for PC or laptop with Windows 32 bit and 64 bit operating system. It is in browsers category and is available to all software users as a free download.